A honey bee visits a blueberry flower in Michigan. Photo: Emily May. 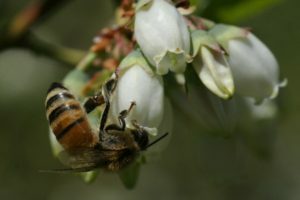 Highbush blueberries grown in different regions of North America are pollinated by markedly different communities of bees, with economically important pollination deficits in blueberries grown outside of the natural range of its wild relatives, according to a new study published today in PLOS ONE. The team of Project ICP researchers, led by Jason Gibbs at Michigan State University and Elizabeth Elle at Simon Fraser University, found that in Michigan, where highbush blueberries have been commercially grown for over seventy years, the bee community visiting blueberries had greater species richness and diversity than in British Columbia, where blueberry was introduced relatively recently. The most important blueberry pollinators differed between the two surveyed regions: in British Columbia, the primary predictor of pollination service was the abundance of wild bumble bees, while in Michigan honey bee abundance was the main driver of blueberry pollination. The yields from the surveyed commercial blueberry fields in Michigan were generally close to maximum estimated yields (around 94% of the maximum), but pollination deficits in British Columbia meant that fields in that region averaged 38% lower yields than the estimated maximum yield given full pollination. The authors suggest that the lower abundance of pollinators in British Columbia blueberries relative to Michigan may be due in part to a lower proportion of semi-natural area in the landscape surrounding blueberry fields in that region compared with Michigan. Semi-natural habitats provide bees with flowering and nesting resources that can boost their populations in farm landscapes. To learn more, read the original article in PLOS ONE here.